Well, really it's nice to hug a sheep every day, but October 28th will be the extra special day this year! 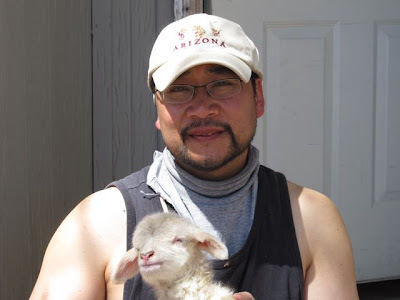 "I had the honour and privilege of volunteering as an apprentice shepherd's assistant to Navajo shepherds at CAC Red Mesa Sheep Ranch (now closed) in New Mexico. Worked with Navajo Churro Sheep. Have a photo of me holding a one day old baby ram. None of the ewes would claim him so we had to bottlefeed the little guy." David W., New Mexico. Please be kind and always ask before you use any photographs or artwork.